Dress up Jayne Cobb however you'd like! 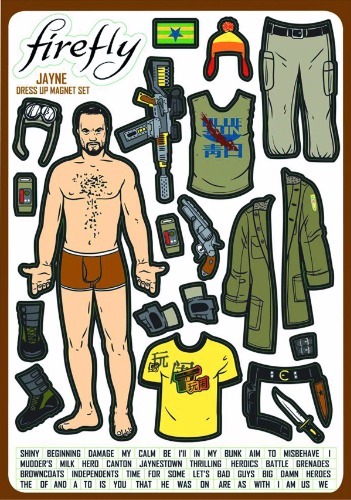 This Firefly Jayne Cobb Magnet Set features the actor Adam Baldwin in his skivvies surrounded by a large amount of clothing and accessories seen on the character in Joss Whedon's Firefly. It's a great fridge display piece for Firefly and Serenity fans!